So I flew across the country, from Phoenix to Orlando, and since we just moved I couldn't find the second seat to the stroller. Since we just use the ramp and one sit while in the airport I figured I would rent a stroller. 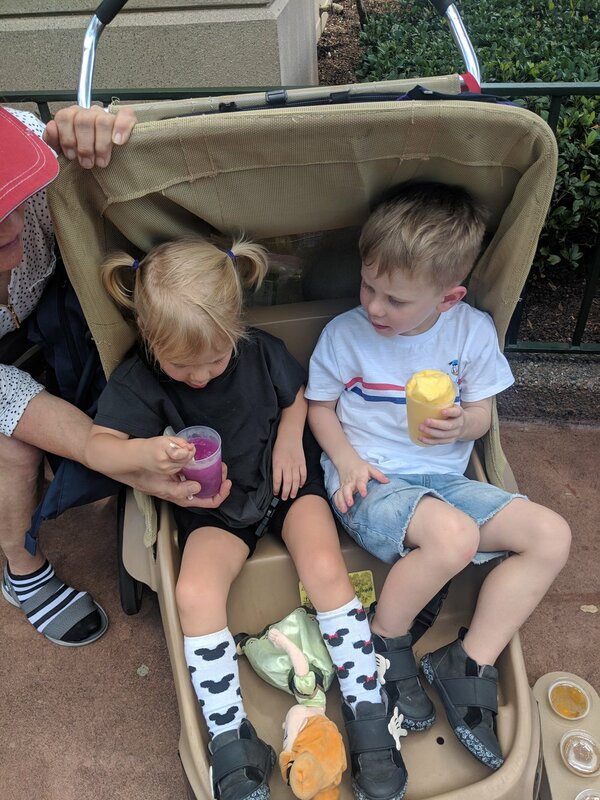 We rented at Epcot, for $31 dollars for a double, and you can keep the receipt and get another stroller if you switch parks that day. They can NOT leave the park. At Epcot you can get one at the main gate and also the International Gateway. We rode the boat from Swan Resort and after you enter the gates the stroller pickup is right there. The price was good, the ease of renting was awesome, and the convenience of not lugging a stroller was there. Here are some of the cons. 1. I have a two and four year old, pretty average size children, and they couldn't fit comfortably. It was way to tight of a fit. 2. Sun shade didn't do it's job. Our sunshade couldn't straighten out and didn't even go out far enough. The sun was constantly in their eyes and that wasn't good during nap time. 3. There is no head support behind their heads. So when nap time happened (which was separate for each kid since they both couldn't fit comfortably) their heads would bob back and forth. I have no idea how other kid slept in them. 4. Not much storage. There is no under storage just two pockets on the back and two drink holders. Which didn't hold much . In conclusion, I will NOT be renting a Disney stroller again. I tried and I failed. It was a BUST. I will be checking that extra seat at the airport and have trouble folding that thing to get on the bus or monorail. All that hassle was worth the sunblock, storage, and napping that happened. Jan 31 Why Sci-fi is my favourite HWS restaurant. Apr 13 The 3 different ways I have booked a Disney vacation.